Times are challenging, lamented an oil refining source in the wake of falling margins and industry throughput especially in the second half of this year. "2013 was a bit poorer than last year, with refineries here running largely on opportunity basis. And 2014 will definitely be no better, especially as new refineries emerge and markets stay weak. The dynamics have changed," he said. "As for upgradings and new plant investments, companies here are likely to adopt a wait-and-see (approach) before splashing out any more money." Such gloomy remarks echo reports of how new rival refineries in China and India will further flood global capacity, raising the spectre of thin margins in coming years. Eugene Leong, the Economic Development Board's (EDB) head of Energy & Chemicals, agreed that "if we are talking about just refining, I would be worried". That said, over the last few years, Singapore has steadily integrated oil refining with chemicals in a big way, resulting in naphtha cracking capacity here doubling to 4 million tonnes per annum (tpa) in a short time, making the industry here more robust, Mr Leong added. "Having these two legs helps us even if the macro- environment is going to be tough. And Singapore now wants to add a third leg through lubricants," he said. "We see opportunity for refineries here to further upgrade, especially with the consolidation of refineries in Europe over the last few years, and also in Asia, like in Australia and Japan. All this points to increased focus on Singapore being the refining hub for this region." However, "it is important for our refineries to become more complex", Mr Leong stressed. The push to add a lubricants leg has started, with companies such as Sinopec, Shell and Total building blending facilities at the upcoming Singapore Lube Park. And then there are the lubricant additive investments by leading players, such as Infineum, Oronite, Afton and Evonik. EDB also sees opportunities for the manufacture of lubricant base oils here, Mr Leong said. At this stage, the only known potential investor for this is Chevron, which is reportedly considering a plant at its joint-venture Singapore Refining Company (SRC) refinery. Given the fast-paced investment flow here over the past 3-4 years, including new multi-billion-dollar petrochemical complexes, Mr Leong reckons the refining/ petrochemicals industry is "in the digestion phase" now. This is the time for the industry to build up flexibility and resilience to global competition, including through new technology, he said. ExxonMobil, for instance, has built feedstock flexibility into its new Singapore cracker, enabling it to even process crude oil into finished chemicals - a world first. 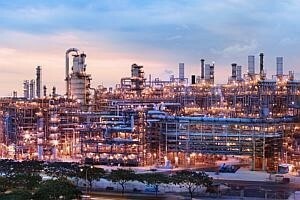 Similarly, it must build flexibility in markets by moving from producing just "plain vanilla" base chemicals to producing higher-value specialty ones like those at its two new chemical "corridors" on Jurong Island for synthetic rubber and also high-purity ethylene oxide (HPEO). Mr Leong said that while rivals like South Korea and Taiwan are also moving into this space, Singapore's advantage is that it has drawn in the global leaders which possess the technology to continually innovate and find new products and applications to ride out market cycles. "We have consciously grown Singapore by anchoring the market leaders here," he said. This is not just for the big upstream crackers, but also for the secondary plants like in the HPEO corridor, where it has attracted leaders like surfactants maker Solvay and another leading oilfield chemicals maker, whose name has not been disclosed yet. In this "digestion phase", the industry has started looking at opportunity costs and savings, including ways to make plants more efficient and competitive. "We are working closely with the players on some JI 2.0 initiative projects for this," Mr Leong said. For instance, Royal Vopak's building of an LPG (liquefied petroleum gas) terminal here will help bring in an alternative feedstock, which is cheaper at certain times of the year, for the largely naphtha- fuelled petrochemical crackers here. The Republic is also rolling out a new energy efficiency measure, namely a heat integration plan, to enable plants on the petrochemicals island to share their excess heat or steam generated during operations. Noting that "while global market conditions will have an impact on the industry here, we can't control markets", Mr Leong said the measures are aimed at ensuring that "the Singapore industry has the resilience, robustness and flexibility" to ride out volatility. He added: "For instance, the big story today is shale gas, but we don't know the conclusion to this yet, including its impact on Singapore. Many companies here are also building projects there (in the US) to capitalise on availability of the advantaged feedstock. So the question is: will attention be diverted from Singapore in the short term? "The real conundrum today is that while the market is here (in Asia), the feedstock is there." While Singapore has succeeded in securing global leaders like ExxonMobil and Shell - which have built their largest manufacturing sites here, including plants producing higher olefin specialties that the shale gas crackers cannot produce - industry development has to go beyond this, Mr Leong emphasised. An example is new German investor Lanxess - which, beyond its big synthetic rubber plant investments, has anchored its global butyl rubber HQ here. Similarly, Evonik, on top of its manufacturing operations, has added an R&D laboratory and regional HQ here. Their R&D activities will allow players to adjust to new market conditions and enable them to find new applications and products, Mr Leong said, adding that this is another factor that differentiates the Singapore industry from others. He concluded: "So it's a whole clustering of activities beyond manufacturing which makes the Singapore industry robust and able to withstand global volatilities - like competition from Middle East gas 10 years ago, and shale gas today, and perhaps something else tomorrow. "As we grow the Singapore economy and different industry clusters, we are also finding synergies across industries here. For instance, consumer care makers Unilever and P&G have grown here, and we are now finding synergies in that they also need consumer care chemicals - and a lot of suppliers for these, like Croda, are already on Jurong Island." Furthermore, EDB hopes to harness such synergies in other industries, like in upstream oil/gas where oil rig makers and oilfield service providers will also need oilfield chemicals. The bottom line, Mr Leong reckons, is a continued slate of projects - like higher olefins, specialty chemicals and other activities beyond manufacturing - in which the Singapore industry can be a player despite the advent of shale gas. "This will shape the industry here in the future," he said.